Check the conditions of sale and access to the venue here. The ticket is nominal: To purchase the ticket you will need your personal data. The 1 day tickets for the festival can be bought each day from 01:30 in the morning. Tickets for the festival and the campsite can also be purchased at the ticket office, which will remain open 24 hours a day. Free entrance for minors who have not turned 13 by the day the festival starts. Free entrance for those who have turned 65: by the first day of the festival. The entrance is free to all the disabled suffering from serious disabilities (who do not walk and make use of a wheelchair) with a certified minimum of 65%, to the blind, the deaf and to people suffering from serious mental disabilities. Discount for registered voters in Benicassim: We sell tickets at a special price only for people registered in Benicàssim. Each ticket is personal and non-transferable. Each applicant must provide in the accreditation area of the festival the registration certificate in the municipal register for at least one year -from August 2018- and the DNI. The delivery of both documents is mandatory to obtain the access bracelet to the concert venue. Free entry is also provided for one helper, if needed. The helper will receive just one bracelet, which will not be transferable and will be allowed to stay inside the Festival venue for as long as the aided person is there. Minors must be accompanied by a parent or legal tutor or have a written permission signed by their parents or tutors. All children under 16 must always be accompanied by their parents or legal guardians. Minors between 16 and 18 years old who want access to the festival alone must have a permission slip signed by their parents or legal guardians. The entrance to the Camping allows to get to the “Campsite Area” and to use all the services (toilets, showers, etc..). The Glamping Company offers you the possibility of having your tent set up and waiting for you on your arrival, you can consult price and make reservations via their website. The Entrance Ticket to the festival and the Camping area will also be available at the Festival Ticket Office. 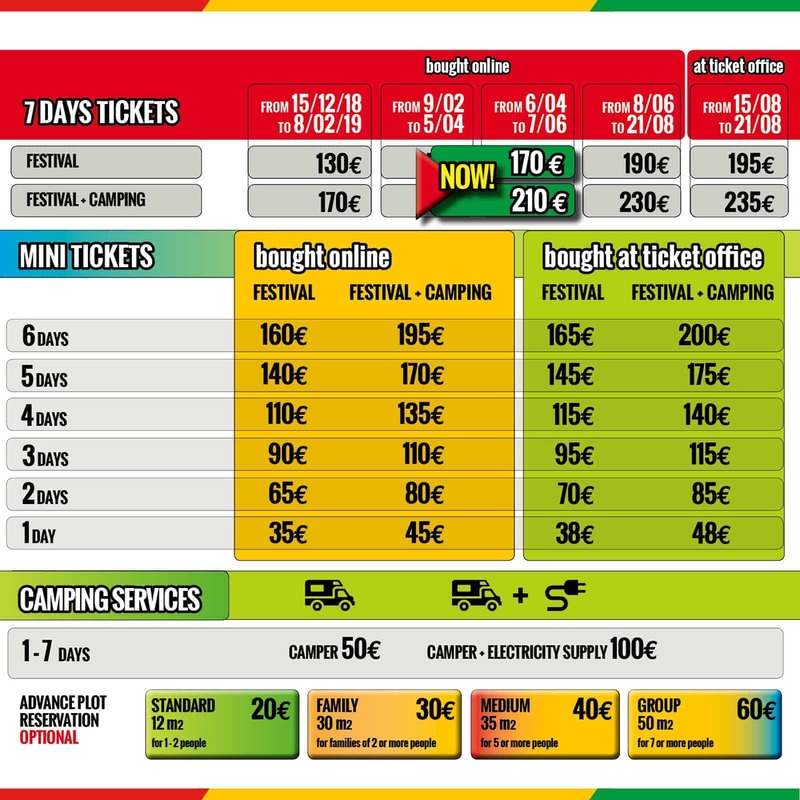 The Camping Area is strictly reserved to the Festival visitors: it is necessary therefore to be in possession of the Entrance Ticket to the Festival, to buy the Camping Entrance one. The cancellation of just one event will not give the right to a ticket refund. The refund for the daily ticket (no passes or mini-passes) is allowed only if all the shows of the day are cancelled. Early bird tickets are not refundable, and it is transferable only by exchanging the name. The ticket is transferable to third parties only by changing the name through our on-line change name service*. Click on this link to change the name of your entry. Access with the locator of your entry and the surname of the festivalgoer. Select the option “Name change”. Select the first and last name of the new festivalgoer. Insert your card details and finalize the payment*. *To avoid the resale of tickets the cost of this change is 10€ in case your ticket has the same current cost. If the price of the ticket has increased, the cost to pay is 10€ plus the difference with the current price. The organization reserves a right to withdraw the ticket (no refund) and to expel from the festival those responsible for unsuited acts according to a respect based logic (robbery in the tents, damaging of properties, drug dealing, violence, etc..). Leave your dog at home. We advise that you do NOT bring your dog to Sunsplash as access to both the festival area and all town beaches is not allowed. The only ones who can access the site will be small dogs (up to 8kg in weight). We also do not allow the entry of breeds considered dangerous, such as: Akita, Rottweiler, Pit Bull, Doberman, Napolitan Mastiff, Japanese Tosa, Dogo Argentino, French Mastiff, Bullmastiff, Staffordshire, Canarian Molloser and Fila Brasileiro. Dogs trained to assist people with disabilities related to sight, hearing or reduced mobility Re permitted entry to the festival. Also allowed to enter are dogs trained to assist people with different pathologies such as diabetes, breathing problems, autism, etc. Those people who wish to enter the festival with a dog of this kind must present the animal’s relevant documentation that certifies their training, as well as the need for its presence. The CAMPING will open its doors on August 15 at 12:00 noon and will close on August 23 at 16:00. The festival TICKET OFFICE will open on August 15 at 12 noon and will close on August 23 at 01:30. The VENUE will be closed every day between 07:00 and 14:00. See our FAQ section to see your most frequently asked questions, probably the answer you are looking for is there.